If you are a woman who wants to undertake shamanic journeys in your full feminine power, or if you’re a man who wants to journey with the support of feminine shamanic power, you will find this CD very helpful. The practice of shamanism has been profoundly influenced by masculine, patriarchal ways. One of the ways in which that influence is expressed is through the kind of drumming that is generally used for shamanic journeying. Such drumming is more often than not hard and driving, with call-backs that are abrupt and startling. 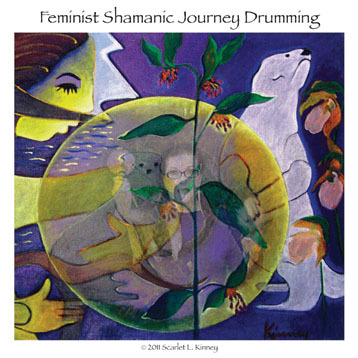 As I developed Feminist Shamanism® over two decades of shamanic practice and teaching, I realized that this type of journey drumming is not suitable for women, nor for men who wish to journey supported by feminine shamanic energy. This CD is a response to that realization. It contains the proper level and intensity of trance-inducing percussion and sound required for you to undertake shamanic journeys supported and inspired by feminine shamanic energy. It is recorded to sound live. It offers powerful support for undertaking two very different levels of shamanic journeying. Each of the two tracks begins with original shamanic songs and chants that take you gradually towards shamanic consciousness before segueing into journey drumming. The call-backs are long and gentle, giving you plenty of time to gradually return from your journey. The insert contains phonetic and drumbeat notations for the main chants on each track. It also contains instructions for smudging in the women’s shamanic way, and properly preparing yourself to journey. almost immediately, and have had some of my most intense and powerful journeys while using the CD. I would definitely recommened it!